Nobody understands this proverb better than 30-year-old Myanmar native Win Min, who graduated in June with a degree in planning, public policy and management. Nineteen years ago, Win left his remote farming village alone and on foot to find work in Mandalay, Myanmar’s second largest city. After seeing “wealthy people” from the city on his village’s only television, he believed he could make big money there to help his struggling family, and convinced his parents to let him go. He was to return home at the end of summer, when he would be needed on the family farm. The year before, Win’s parents had pulled him out of school because they couldn’t afford the mandatory tuition. Now, he realized a primary education would never be enough to get a good-paying job to help his family. He had to find a way back to school. Distraught and disillusioned, he considered going home. Then he heard about Phaung Daw Oo Monastic Education High School, a free school for underprivileged children. “It was a little bamboo school built on a city dump,” Win says. Because the kids at the school were considered “trash kids,” he says, tourists became interested in them and came to see the school. Win met visitors from all over the world. After memorizing common English phrases, he began following tourists to popular sites in Mandalay and led tours up and down Mandalay Hill, a Buddhist pilgrimage site with a panoramic view of the ancient city. During the tours, he made friends with US Embassy officials. 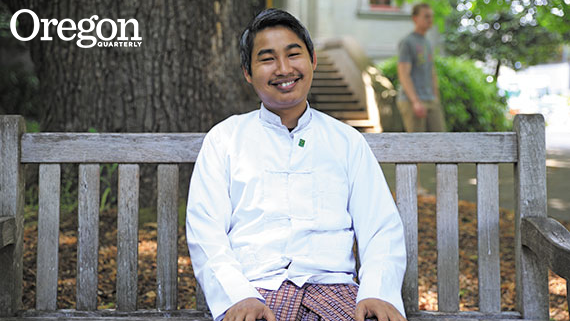 After high school, they invited him to come to Yangon, Myanmar’s largest city, to study English at the embassy’s school, called the American Center. In Yangon, Win also took classes at the British Council, thanks to scholarships, and worked as a waiter at the British Embassy Club, where he met influential people and started building networks. As his English improved, he began teaching the language at the monastic school in Mandalay. From there, a series of fortunate events led him to a TESOL (Teachers of English to Speakers of Other Languages) conference in Thailand in 2008, where he met UO linguistics instructor Cindy Kieffer. She invited him to come and study at the University of Oregon. He didn’t know much about America, he says, and had never considered leaving his country, so he declined the offer. In 2008, Cyclone Nargis hit Myanmar. It was the worst disaster in the country’s history. Because Win knew so many influential people by then, he organized a successful relief effort and earned a reputation as a compassionate and effective community leader. He was asked to join with some of the major nonprofit organizations working in the area, but soon grew disheartened by their ineffectiveness and lack of hands-on experience. He took a step back and started thinking that maybe a university education would give him insights that could help him make real and lasting changes in his country. In 2010, Win finally accepted the UO’s invitation. Arriving on campus in October, he was too late for a scholarship, so he started taking English courses at the American English Institute, where Kieffer was the director. He began his university classes the following fall.